The Sacramento Kings released their 2017-18 schedule Friday afternoon. While the league has added 10 days to the calendar, the Kings schedule is still packed with 16 sets of back-to-backs and a season-long six game road trip during the month of January. It's a whirlwind of excitement that begins October 18 with at the Golden 1 Center. Here are seven games to look forward to as the Kings embark on their 33rd season in Sacramento. Opening night 2017-18 - October 18 - Kings v. Rockets - Hope spring eternal with the tip off of another season of Kings basketball. Of the 17 players expected on the opening day roster, 10 are new to the team, including De'Aaron Fox, Bogdan Bogdanovic, Vince Carter and George Hill. It's a young an exciting squad with only five players with more than two seasons of NBA experience. The Kings open their schedule at home against James Harden, Chris Paul and high-powered Houston Rockets. 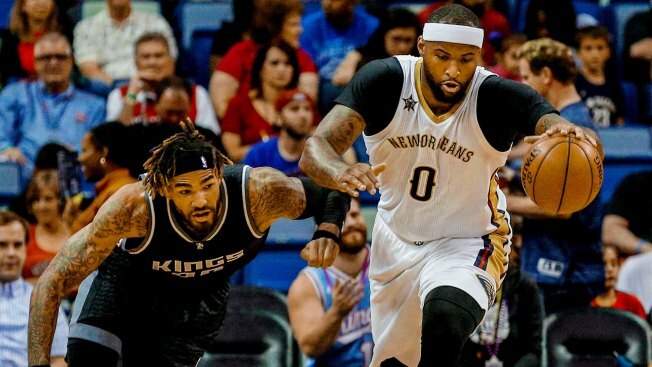 DeMarcus Cousins comes home - October 26 - Kings v. Pelicans - After 6-plus seasons in a Kings uniform, the 3-time All-Star returns to Sacramento for his first game from the visitors locker room. He'll bring along another familiar face in former Kings point guard Rajon Rondo, who inked a one-year deal in New Orleans over the summer. Expect a ton of emotion, both from Cousins and a packed full house of Kings fans. The Process vs. The Rebuild - November 9 - Kings v. 76ers - The 76ers have spent the last decade working on a plan to accumulate great young players while piling up losses at an alarming pace. Sacramento pulled the plug on the DeMarcus Cousins experience, instead choosing to go with a full youth movement. Fultz vs. Fox will headline the night, but there is plenty of intrigue as two of the youngest teams in the NBA battle it out. Fox vs. Ball - November 22 - Kings v. Lakers - The rivalry between these two young guards is only going to get better with age. Fox likely won't start the season with the first unit, like Ball, but he'll get plenty of opportunity to shine. For better or worse, it's Ball's show in LA. Let the trash talking begin. Rudy Gay makes his return - December 23 - Kings v. Spurs - Rudy Gay took a huge gamble and an even bigger pay cut when he opted out of the final year of his contract with the Kings. He and his rebuilt Achilles tendon landed in San Antonio on a two-year, $17 million deal. He'll likely play for a playoff spot for only the second time in his 11-year career. Dennis Smith visits Sacramento - February 3 - Kings v. Mavericks - The Kings jumped all over the chance to draft De'Aaron Fox with the fifth overall selection and in doing so, they passed on another incredibly talented young guard in Dennis Smith. Dallas may have stumbled on a superstar and Smith likely has a list of all of the teams that passed him over in the 2017 NBA Draft. The Champs come to play - February 4 - Kings v. Warriors - The Warriors and Kings have taken turns being awful over the last 30-plus years. While the Kings are predicted to miss the playoffs for the 12th straight season, Golden State is the odds on favorite to take home their third ring in four years.With just 90 miles separating the two fanbases, it should be an interesting mix of purple and yellow in the crowd.